Aceic's management has a strong blend of engineering and business execution skills, which helps firms quickly ramp up and build high quality verification teams ensuring TTM and ROI. When you are partnering with us, you're aligning with a strategic technology services partner committed to meet your unique business and design objectives on time, on budget and with an optimal experience. By leveraging our verification expertise, flexible business models and world class training infrastructure you can increase revenue, reduce costs and reinvest in innovation for gaining the critical competitive advantage. Values are the foundation of our success. Our values are centered on collaboration and excellence in what we do to deliver the highest quality of customer satisfaction. Customer is the key to our success: We perform always at the optimum levels, thereby ensuring customer success. Employees are our strength: We create the work environment reflecting people's passion and attitude to bring forth the best creative and technical skills. Respect and integrity: We create an environment of complete trust, respect, integrity and honor. Execution is our mantra: We invest in processes and systems that adds substantial value to our customers, thereby making us their most reliable and trusted partners. Value creation: We create substantial value for our customers by helping build world-class products and services of the highest quality at optimal value and time. 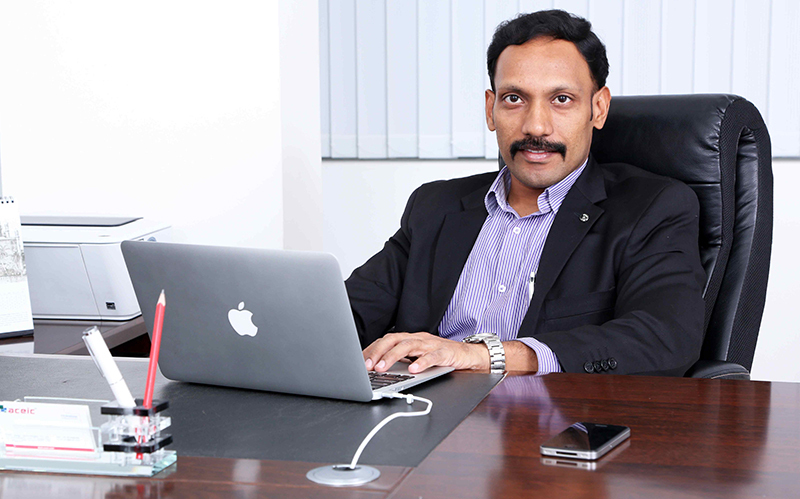 Sivakumar is the Founder and CEO of Aceic Design Technologies. He is responsible for the company's vision, overall strategy, business and technology. He is also the Founder and CEO of Maven Silicon, a VLSI Training services company which holds the credit of producing 250+ highly skilled VLSI engineers every year. Sivakumar is a seasoned engineering professional who has worked in various fields, including electrical engineering, academia and semiconductor industries for more than 17 years. In semiconductor sector, he has worked as a Verification Consultant for the top EDA companies like Synopsys, Cadence and Mentor Graphics. For more than 12 years, he has helped various ASIC and FPGA design houses deploy and use various verification methodologies effectively, resulting in successful tape out of SoCs and Chips. He now specializes in offering verification consultancy services, EDA flow development and corporate trainings on advanced ASIC verification methodologies and technologies. Cadence Design Systems in USA and has delivered various corporate training courses at IBM, Free Scale, Cypress, Broadcom, Qualcomm, ST Micro, AMD, AvagoTech, Wipro, etc. Sivakumar holds a degree in Electrical and Electronics Engineering from Madurai Kamaraj University. What Industry Says about our CEO? Our experience with ACEIC Design Technologies has been nothing but pleasure. Starting from the top, Siva and his management team, were very good to work with, accommodating all our requests. They let us interview and chose candidates from their pool, a kind of rarity in the intense competition and a surge in demand that service organizations are experiencing these days. Siva was also very informed and knew exactly where the organization is headed. Although a new player in town, talking to them gave me confidence to give them an opportunity. Together we came up with a business model that was a win-win situation for us and it all took off from there. Siva is a very good strategist and looks at things with an open mind. Siva is deeply technical and has strong domain knowledge of verification and verification methodology. The industry needs more and more verification design services companies and would highly recommend Siva for their projects. Sivakumar is an enthusiastic and result oriented person who is self driven to achieve the goals he sets. He has good background in verification methodology and practices which he has proven many times. I had the pleasure of working with Sivakumar together on various technical engagements. Sivakumar has a passion for technology and teamwork, which is very refreshing and it is a delight to work with him. Sivakumar understood the core values and requirements of his position and executed to fulfill them. I wish him all the very best in his career.